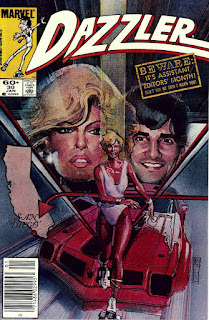 Assistant Editors' Month Online: Dazzler #30-Special "Tribute To Ralph Macchio Editon"
Dazzler #30-Special "Tribute To Ralph Macchio Editon"
This post is dedicated to long-time Marvel Writer-Editor Ralph Macchio. I began typing up this tribute last Summer, shortly after his retirement as Senior Editor was announced. As I mentioned in my last post, my "offline" life got crazy last Fall, so I fell behind. But better late than never, here's my "Thanks for everything, Ralph!" 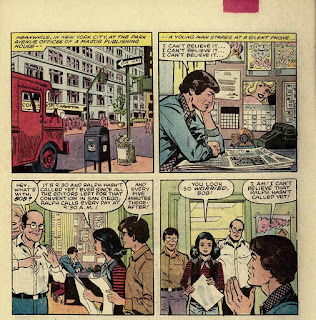 post honoring Ralph Macchio's many years of service as writer, editor and other stuff at Marvel Comics. I'd like to personally thank Mr. Macchio,he helped make my youth more enjoyable than it would've been without him, especially his stint at Marvel Two-In-One. 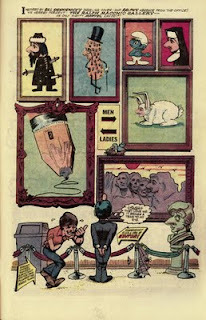 Today we look at the Dazzler's contribution to Assistant Editors' Month. 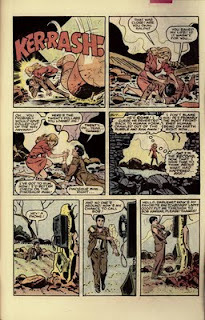 For those unfamiliar with the character, Alison Blaire first appeared in X-men #130. She had the mutant ability to turn sound into laser beams, which she used to create light shows at her concerts. 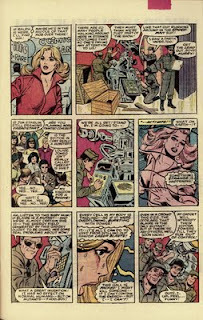 Dazzler was created by a committee of writers & artists (including such luminaries as Tom DeFalco and John Romita Jr.) so that Marvel could cash in on the disco craze...when disco was dying. 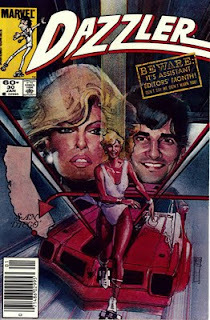 She was later given her own title (#1 was cover dated March 1981), it ran for 42 issues before being cancelled in late 1985. Our Assistant Editor is once again Bob Harras. The cover features a great painting by Bill Sienkewicz, with the AEM "warning" stamp. 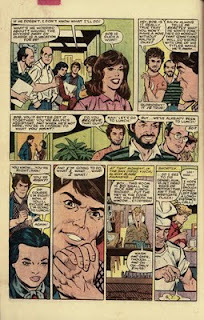 Macchio can be found on the right side of the cover, and he's also caricatured in the corner box. 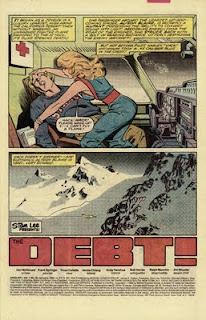 'The Debt' was written by Ken McDonald, penciled by Frank Springer and inked by Vince Colletta. In the "goofy credits" tradition of AEM, Bob Harras and Ralph Macchio are listed as "Acting Editor" and "Absent Editor", respectively. 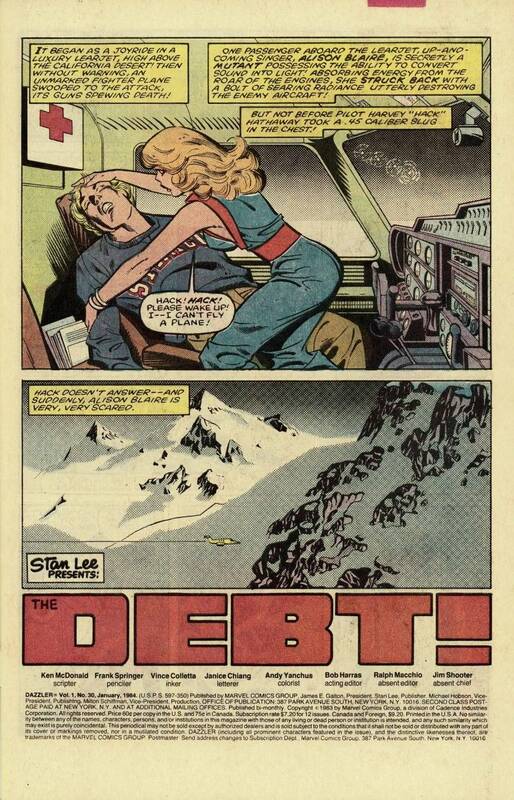 We open with Dazzler on a plane that has just been attacked (in the previous issue) by jet fighters. 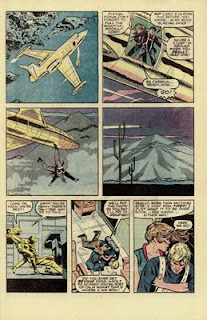 Hack, the pilot has been shot, Dazzler is attending to him. 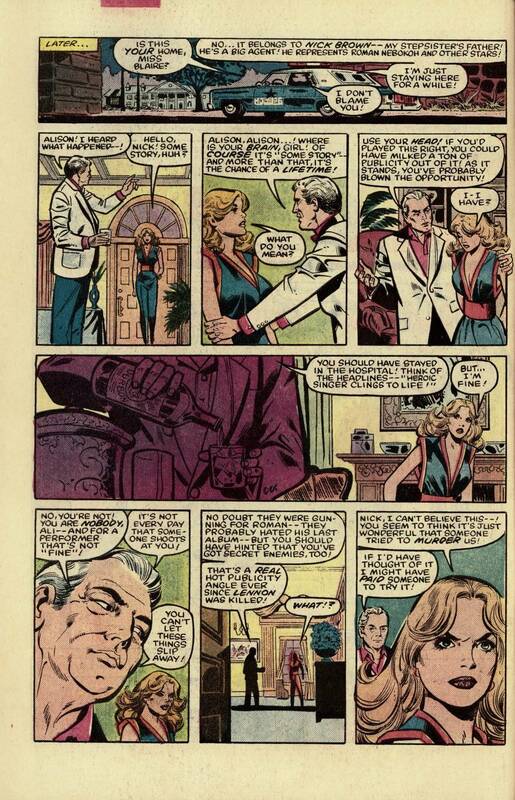 The plane is owned by Frank Sinatra-esque Hollywood has-been Roman Nekobah, who was pursuing Dazzler's affections at the time. 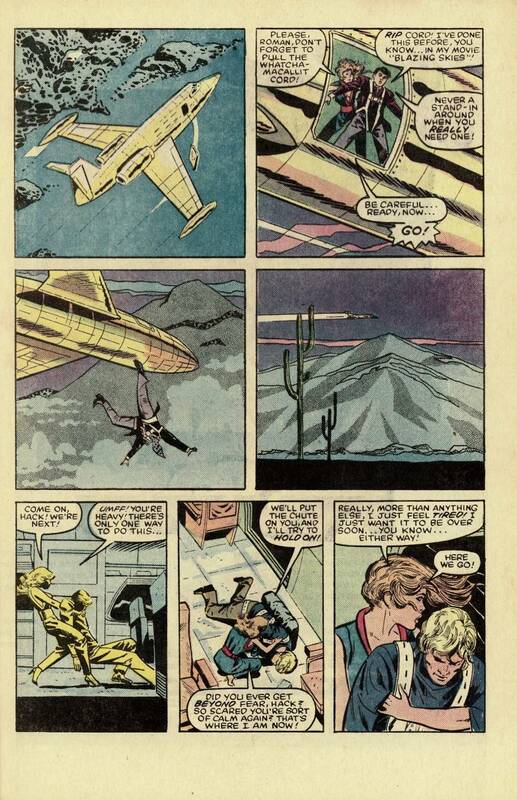 After he flirts with Dazzler,she puts a parachute on Roman and helps him off the plane. She attaches the other chute to the wounded Hack and jumps out with him. 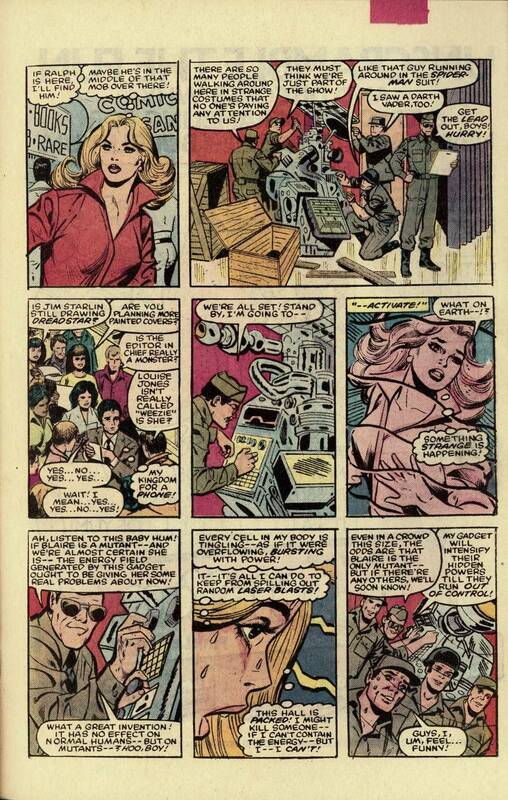 Dazzler uses her powers to attract help, they're spotted by the local police. 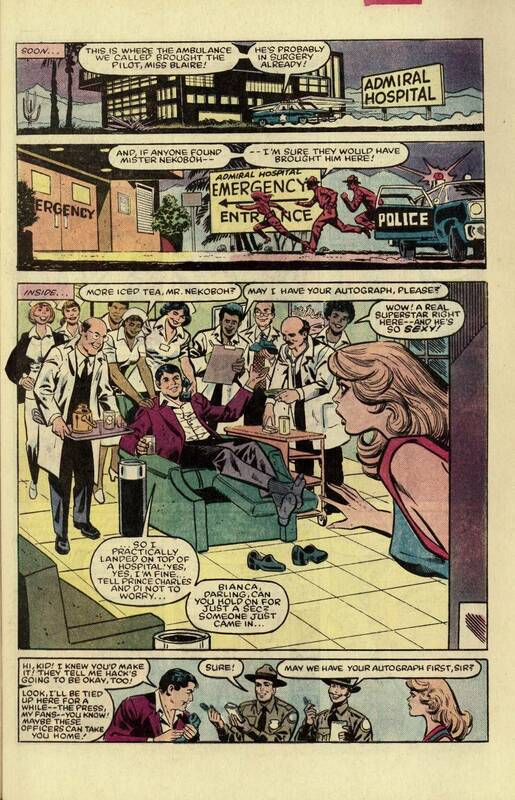 Hack is taken to the hospital, Dazzler follows and finds Roman holding court. The police give Dazzler a ride to the home of Roman's agent Nick Brown, who's also married to Alison's step-sister. After learning that she didn't stay in the hospital, Nick chastises her for not cashing in on the incident to promote her singing career. He says he'll represent her and "provide" with anything she needs, including drugs and men. She is disgusted by this and lets him know. Her step-sister Lois hears them arguing and agrees with Nick, saying that Alison knows how tough and sleazy the music biz can be. Alison is disappointed that Lois takes Nick's side in the argument and decides she can no longer stay with them. 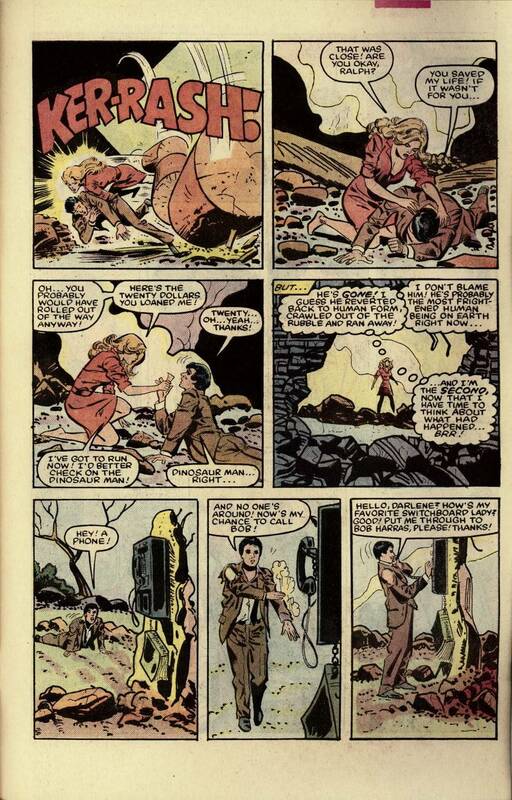 She walks out, telling Lois she will always care about her. Alison has no money, so she's forced to hitch hike. 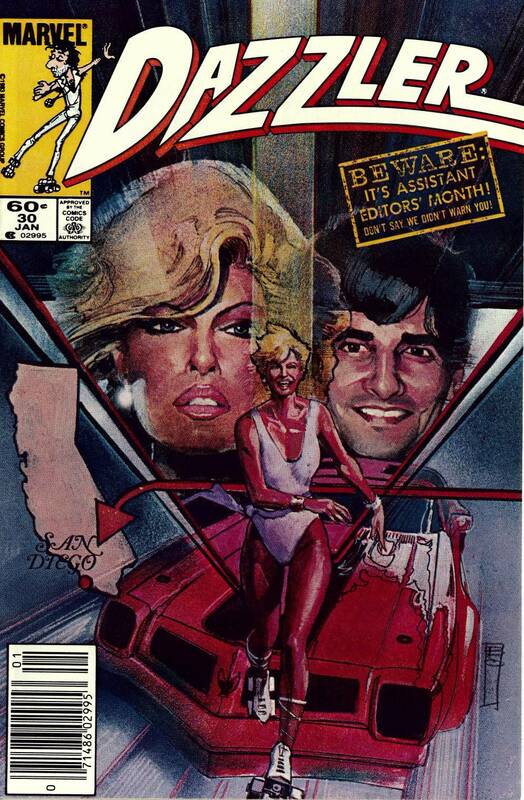 She is picked up by none other than Ralph Macchio, the regular Editor of the Dazzler series! 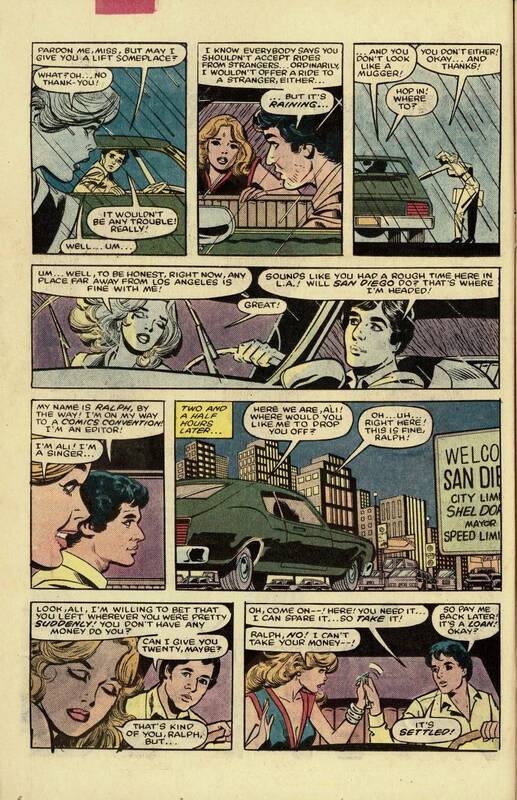 He's driving to San Diego for the Comic Con, she decides San Diego is as good as anywhere. 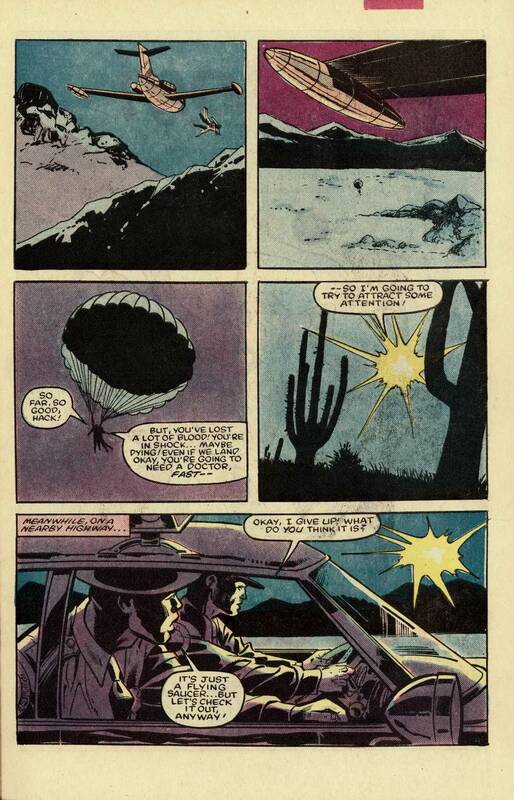 We then cut to an underground base in the Sierra Nevadas, where the men who shot down the plane are planning their next move against Dazzler. The officer in charge tells them he is off to DC for meetings with Generals, his assistant Crespi will temporarily take command. 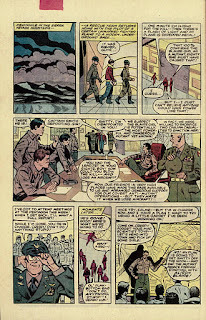 Crespi's name is a reference to Danny Crespi, a long-time Marvel Comics letterer. We cut to the Marvel offices in New York. Assistant Editor Bob Harras is wondering why his boss (Ralph Macchio) hasn't called. The other Assistant Editors talk about how Ralph has called in every day at 9:30 and every 15 minutes thereafter. Harras is worried about Macchio and the other Editors, wondering if something bad has happened to them. 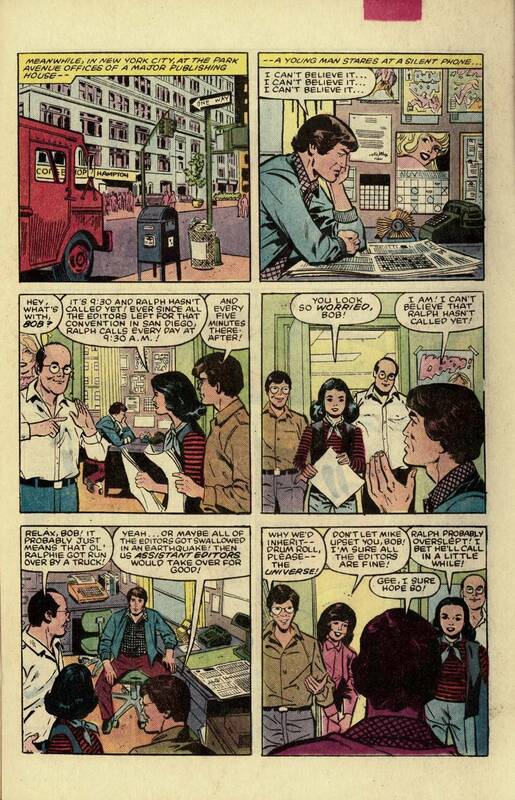 On the other hand, Mike Carlin hopes they never return to Marvel, so the Assistant Editors can take over for good! 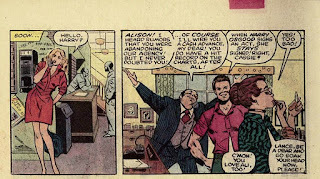 Harras is afraid to do anything without Ralph's approval, but he gets a pep talk from fellow Assistant Editor Ann Nocenti. She reminds him he's in charge while Ralph is away and he can do whatever he wants. Harras agrees and is suddenly confident in his leadership abilities. Back in San Diego, Alison is staying at the local YWCA, she phones her agent Harry Osgood and asks if he can wire some money. 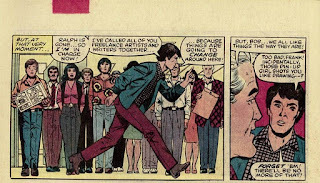 At the same time, Ralph Macchio arrives at the Comic Con and attracts autograph seekers. 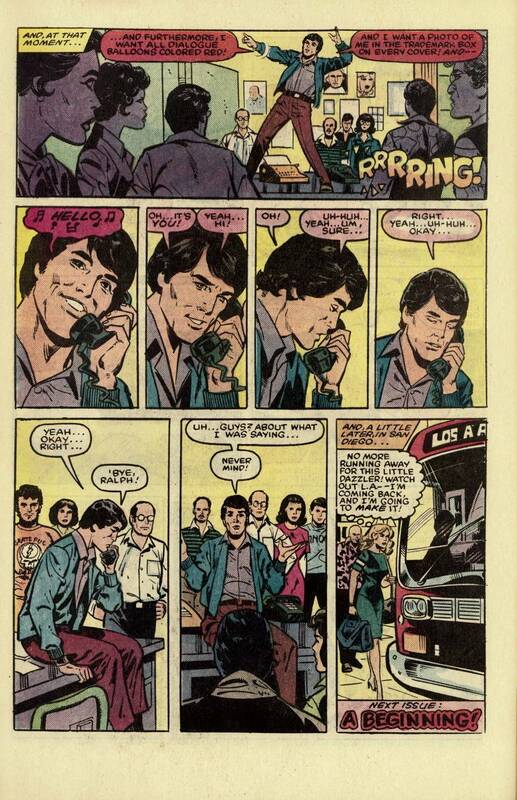 He realizes he hasn't phoned Bob Harras, but doesn't bother. Macchio hopes Harras won't screw up any of the titles he edits while he's away. Back at Marvel, Harras has let his new "power" go to his head. He tells the Marvel creators he's "in charge now!" and has some changes he'd like to implement. 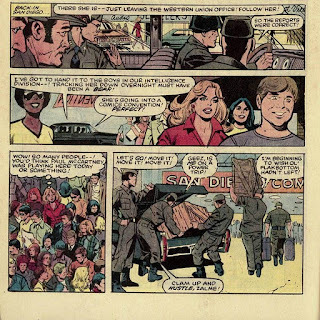 In San Diego, Alison goes to Western Union to get the money from Harry and is spotted by Crespi's anti-mutant military unit. Just like Harras, Crespi's has gotten drunk with power. 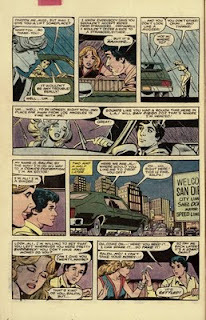 Alison heads to the Comic Con to find Ralph. 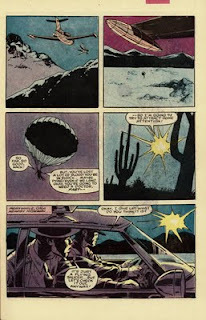 Crespi sets up a weapon that will force any mutant within earshot to use their power and reveal themselves. He believes it will cause the mutants to injure civilians and make it easier for the government to pass anti-mutant laws. 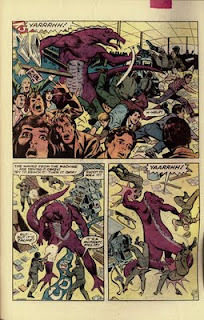 Alison feels herself losing control and tries to get out of the crowd before her powers are activated. But Crespi's machine causes more trouble than he anticipated. 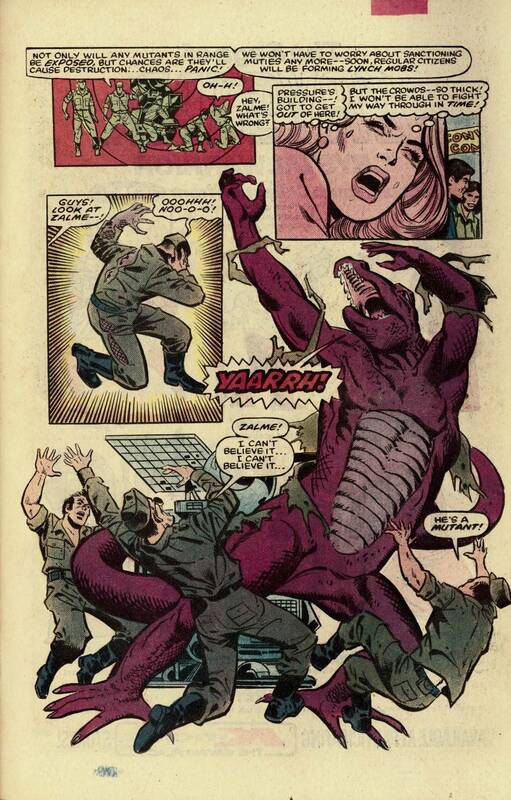 A soldier named Zalme suddenly turns into a dinosaur! 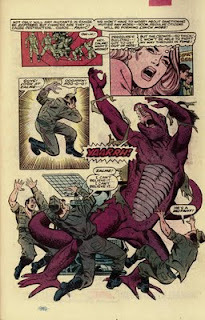 Another soldier notices and screams "He's a mutant!". Zalme's name is a reference to Ron Zalme, who served as Marvel's Assistant Production Manager. 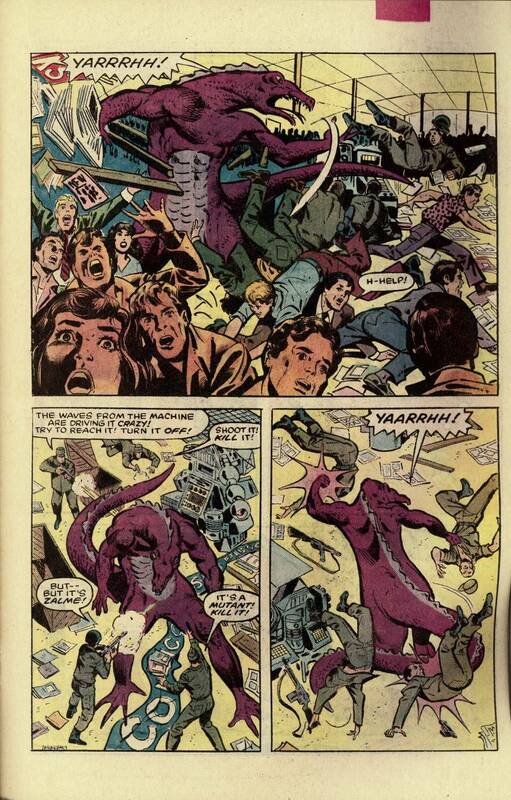 The machine drives Zalme crazy and he starts wrecking havoc in the Comic Con! 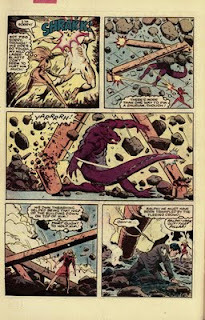 Crespi give his men a "shoot to kill" order, but the bullets have no effect on the dinosaur hide. Dazzler tries to reason with Zalme, feeling a kinship with a fellow mutant. But he lashes out at her. 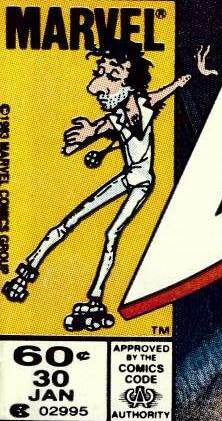 His smashing and roaring helps Dazzler's sound based powers. 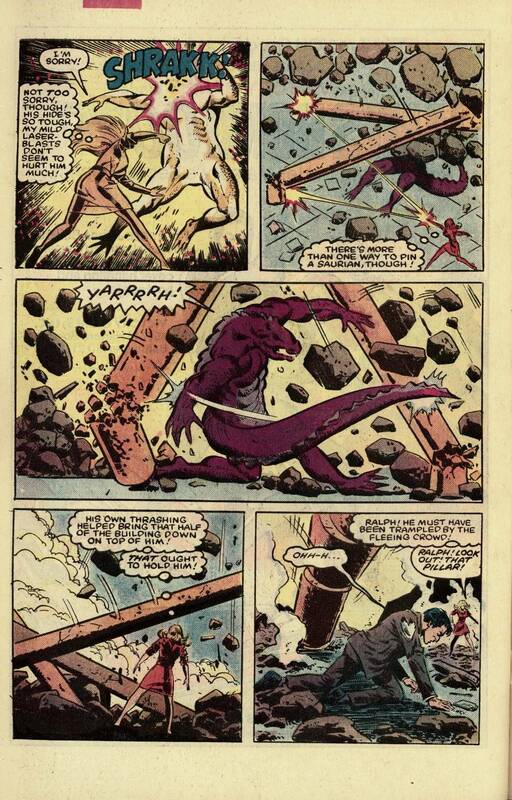 Zalme accidentally brings the building down on top of him, he loses consciousness, their battle is over. Back at the Marvel offices, Harras has completely lost it, ranting like a Third World dictator! He receives the call from his boss Ralph, and realizes he's back to being an Assistant Editor. 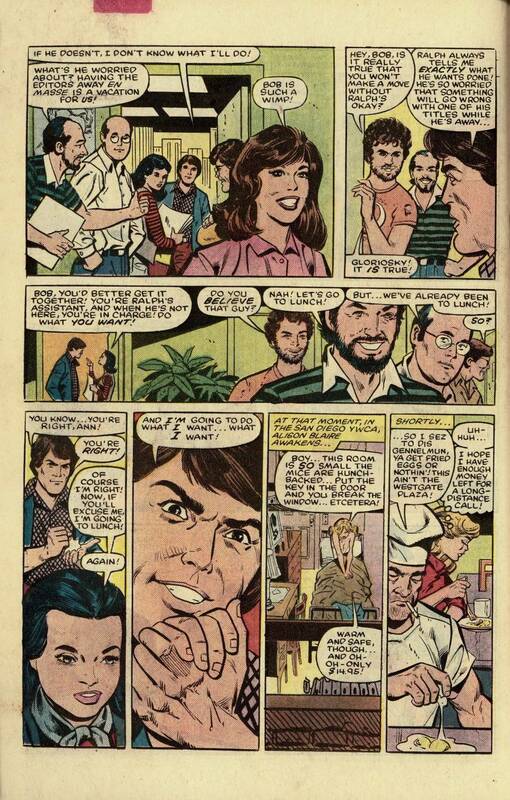 At the same time, Dazzler/Alison decides to return to Hollywood and is determined to succeed in the music business. 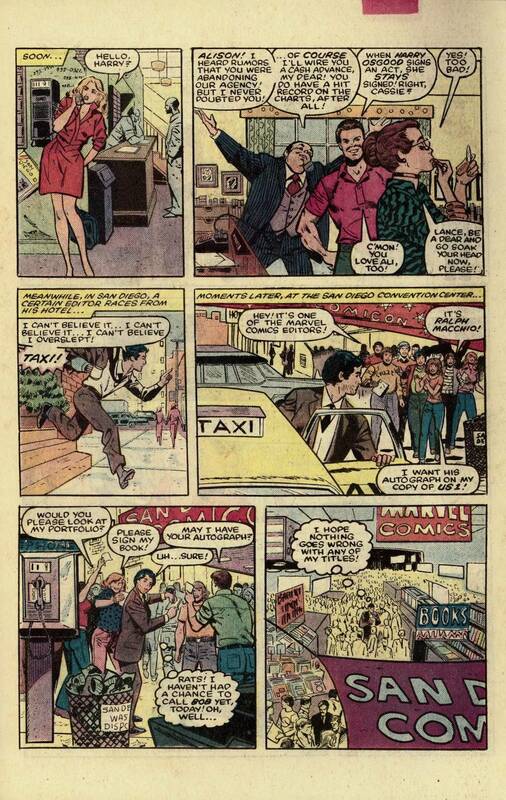 Thanks to Ken McDonald, Frank Springer, Vince Colletta, Bob Harras, and (most of all) Ralph Macchio for giving us a fun issue of Dazzler! 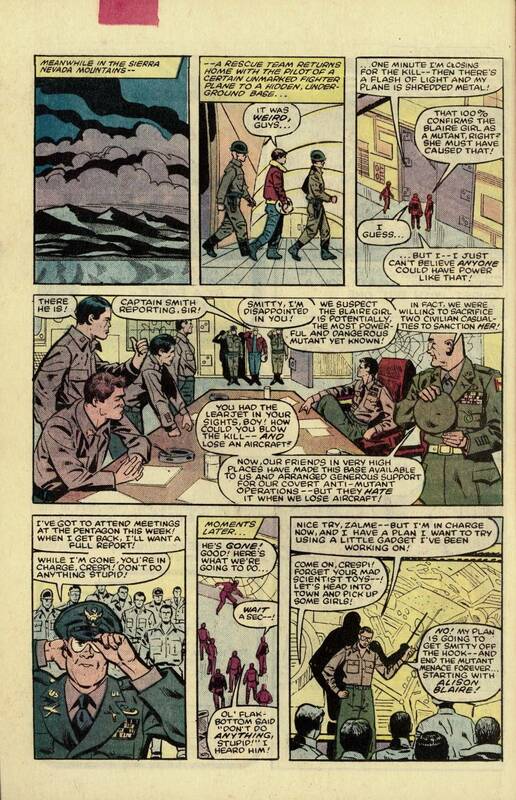 I especially appreciated the parallels drawn between the substitute editor and substitute general in the story. Daredevil and Turk go back to grade school...sort of. In hindsight, Bob Harras taking over Marvel in this issue is even more hilarious, since he became editor-in-chief from 1995 to 2000. 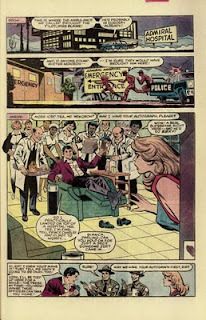 His tenure may not have resulted in red dialogue balloons, but it did result in the infamous Clone Saga going on for even longer. Back at the Marvel offices, Harras has completely lost it, ranting like a Third World dictator! Well that is certainly prophetic! 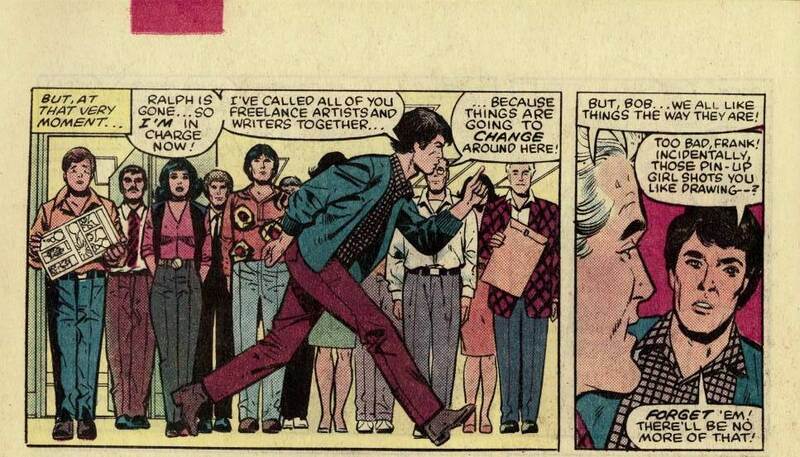 On a more serious note, Ralph Macchio certainly had a very long career as an editor at Marvel, even surviving through all of the upheavals of the 1990s and the company's bankruptcy. Thanks for stopping by Ben! I just checked out your blog, I plan to read it on a regular basis in the future. FWIW, I'll be posting new material here later this week, so check back in the near future.